Gold’s on a roll, courtesy of the Federal Reserve. The precious metal is heading for the biggest weekly advance since July after U.S. central bankers opted once again to leave interest rates unchanged while reining in their outlook for future increases. Bullion for immediate delivery traded little changed at $1,334.55 an ounce at 12:04 p.m. in Singapore after capping a fourth day of gains on Thursday, according to Bloomberg generic pricing. The metal has climbed 1.9 percent this week, the most since the period to July 29, as the dollar fell and investors boosted holdings in bullion-backed exchange-traded funds. Silver, platinum and palladium are also set for weekly advances. 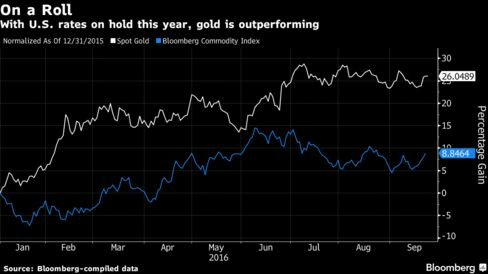 Gold is headed for a third quarterly gain in what would be the longest rally since 2011, when prices rose to a record. This week, the Fed scaled back tightening plans and the Bank of Japan tweaked its stimulus focus, fueling bets European policy makers will keep their easing stance. Efforts by the world’s top central banks to bolster growth including low or negative rates and asset purchases are driving demand for bullion as a store of value. The Bloomberg Dollar Spot Index, which tracks the greenback against 10 major peers, has lost 0.7 percent this week. While Fed officials signaled they still expect one quarter-point rise this year, they now see only two hikes next year, down from a June median projection of three. Bullion has plenty of backers. Among the bulls, Old Mutual Global Investors’ Diego Parrilla told Bloomberg this month that in a world of monetary policy “without limits,” where low or negative interest rates prevail and central banks print lots of money, prices will likely soar to a record within five years. Gold assets in ETFs have expanded every month this year apart from a dip in April, when they lost less than 1 percent. After the Fed’s decision, they rose by about 7 metric tons to 2,031 tons, the highest in more than two weeks, data compiled by Bloomberg show. Bullion of 99.99 percent purity advanced as much as 0.4 percent to 288.09 yuan a gram ($1,343 an ounce) on the Shanghai Gold Exchange. Spot platinum has risen 3.9 percent this week, heading for its first weekly gain since end-July. Palladium has gained 2.5 percent over the same period, while silver climbed 5.3 percent.